Hi, I am interested in your 1959 Ford Galaxie (stock #MJNT055) listed on Autotrader for $19,900. I'd like to get more information about this vehicle and confirm its availability. Worldwide Vintage Autos is pleased to present this 1959 Ford Galaxie. The Ford Galaxie is a full-sized car that was built in the United States of America by Fordfor model years 1959 through to 1974. 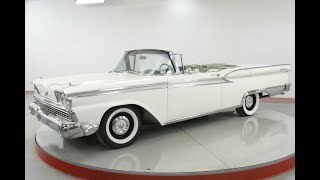 The name was used for the top models in Fords full-size range from 1958 until 1961, in a marketing attempt to appeal to the excitement surrounding the Space Race. For 1962, all full-size Fords wore the Galaxie badge, with 500 and 500/XL denoting the higher series. The Galaxie 500/LTD was introduced for 1965 followed by the Galaxie 500 7-Litre for 1966. The Galaxie 500 prefix was dropped from the LTD in 1966, and from the XL in 1967; however the basic series structuring levels were maintained. The regular Galaxie 500 continued below the LTD as Fords mid-level full-size model from 1965 until its demise at the end of the 1974 model year.